Tri-color glow necklaces are one of the most popular colors of glow necklaces people purchase. Customers ask us all time what makes our tri-color necklaces different? 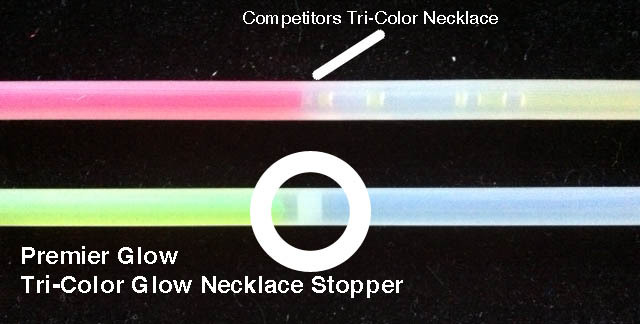 Are all tri-color glow necklaces created equal? – Break apart tri-color glow necklaces: This type of glow necklace is typically the least desirable style of three color glow necklace. The major disadvantage to the break apart necklace is the easy of losing connectors and the possibility of the connectors cracking. However, the advantage is the colors do not mix together. – Chinese tri-color glow necklaces: These tri color necklaces are the majority of the product found in the marketplace. This style is one piece with a connector. The colors inside are separated by nature (gravity). The disadvantage is the colors almost instantly bleed when the glow necklace is activated. When the colors bleed the glow is dulled, and the three colors disappear. – Premier Glow tri-color glow necklaces: We are the sole distributor of our tri-color necklaces which are made in Taiwan. Our tri-color glow necklaces are similar to the Chinese necklaces, except ours have an advantage. We insert internal stoppers between the three colors to help prevent the colors from mixing. By inserting the stoppers we are able to have a longer brighter lasting glow necklace. Be sure to check with your supplier to make sure you’re getting the best product at the best price.